Therefore, visual displays and audio indication can be matched with electronically generated time code information. As an added feature this device transmits the time code over air waves and supplies a portable receiver to connect with production equipment. This device includes a transceiver module that can also be used as a transmitter or receiver by activating a hidden switch that is accessible through the battery compartment. It features an LED light that displays green when in transmitter mode and red when in receiver mode. When used with time code input or output, the transceiver uses a Lemo 5-pin connector. An XLR3F-to-Lemo cable is included. When several of these devices are used in conjunction that can be configured for use as transmitters or receivers as needed. Time of day start up taken from an internal real time clock. Reader/Generator, in which the external code is displayed when the slate is open, and the internal generator code is displayed on closing. Where external time code is displayed from whatever source is utilized. 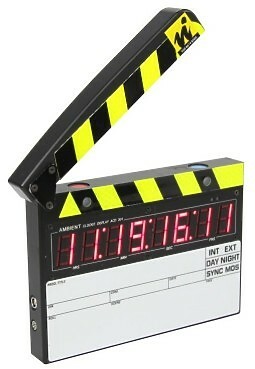 The time code frame at which the slate closed can be displayed for 2 minutes after closing, for logging by the continuity person/production assistant. A flash (full display brightness for 3 frames) at the moment the slate closes, can be switched in to aid syncing with Telecine machines. The Slate can identify the frame rate of an externally connected code, and display errors of up to 2 Frames in 0.2 Frame steps, thus making it an error checker for all recorders and cameras. This device transmits the time code over 915 MHz from the slate to a portable receiver which allows connection to audio devices or with an adapter, video equipment. This feature cures the problem of long cable runs.